TAIPEI (Taiwan News) — Even though the world kept a close eye on the Trump-Kim summit Tuesday morning in Singapore, a low-profile but perhaps more celebratory event was taking place at the same time — the dedication ceremony of the new office complex of the American Institute in Taiwan (AIT), located in a now still primarily residential area slightly remote from central Taipei City. 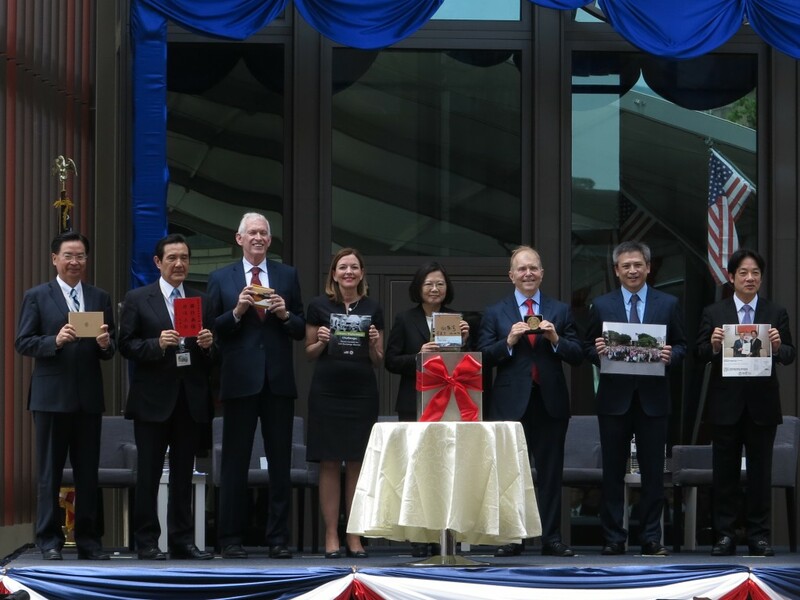 After the de-facto U.S. embassy in Taiwan has operated on its current site in Da'an District for almost four decades, the AIT’s new office complex, which cost US$255 million and took almost a decade to construct, was finally near completion and opening. The 6.5-hectare complex is seen as a milestone for the relationship between Taiwan and the U.S., which have maintained unofficial relations since the termination of diplomatic ties in 1979. 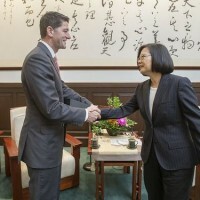 Through a press statement issued last weekend, the AIT, two days ahead of the ceremony, announced that Marie Royce, Assistant Secretary of State for educational and cultural affairs, would represent the U.S. government to unveil the new AIT complex with President Tsai Ing-wen (蔡英文) and other top officials from her administration. AIT Chairman James Moriarty, Republican Congressman Gregg Harper, as well as a number of former AIT chairmen and directors also participated in the ceremony on Tuesday morning. Speaking with reporters before the ceremony commenced, both Moriarty and AIT Director Kin Moy defended the decision of the U.S. government to send Royce to Taiwan for the dedication ceremony. “There’s actually a lot going on in the region today, and we need to respect that truth,” said Moriarty, hinting that the Trump Administration did not wish to have any other events overshadowing the Singapore summit. 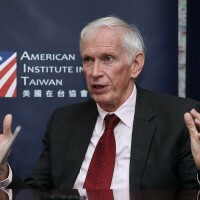 Asked about whether there would be higher levels of American officials coming to Taiwan for the official start of operations at the AIT’s new office complex expected in September, a move that will likely face protest from China, Moriarty said as of now, the institute has not had any specific plans. 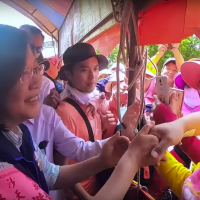 Speaking of Royce, Moy said the assistant secretary was a “perfect candidate” for the dedication ceremony as she “reflects about 40 years of educational and cultural cooperation” between Taiwan and the U.S. 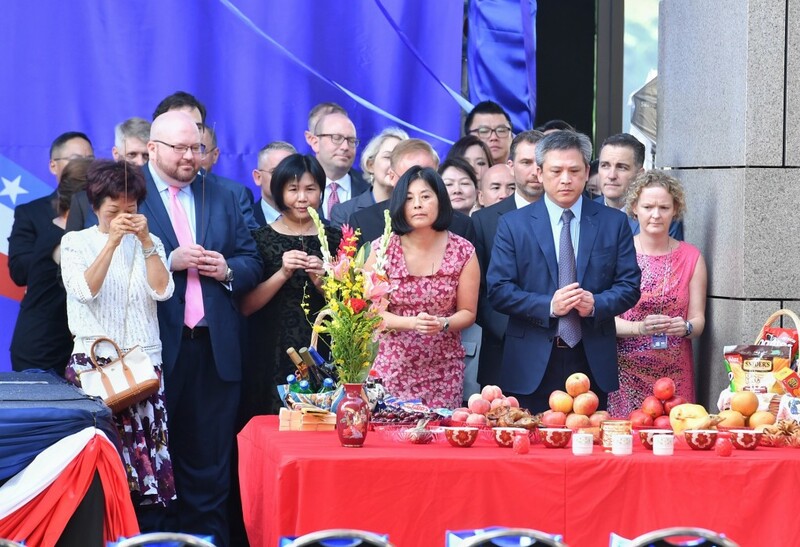 Despite the Western-styled decoration, with American flags flying around, the dedication ceremony was actually infused with Taiwanese and American traditions. Apart from keeping to a schedule suggested by fengshui experts hired by the AIT, its employees and staff, led by Moy and his wife, were holding incense and praying for good luck behind a table placed with fruit and flowers as offerings to the gods before the ceremony — a common practice for businesses in Taiwan on special occasions. Following the beginning performances, including a passionate percussion show and the solemn singing of America’s national anthem, the officials on the main stage, one after another, gave their remarks that were heavily centered around promoting the relationship between Taiwan and the U.S.
“By treating one another with dignity, sincerity, and respect, we would accomplish great things,” said the president. 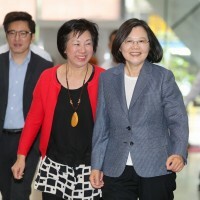 “The new office complex is a symbol of the strength and vibrancy of the U.S.-Taiwan partnership in the 21st century,” said Royce, emphasizing that Taiwan was her first overseas visit since she took office in March. Staying in Taiwan until Thursday, Royce will then continue her Asia trip to Japan, Vietnam, and South Korea. After the drape covering the façade of the new building was pulled off, the ceremony was left with one last activity. Together American and Taiwanese representatives, this time including former Taiwan President Ma Ying-jeou (馬英九) and Foreign Minister Joseph Wu (吳釗燮), put their chosen objects into a ‘time capsule’ box prepared by the AIT. The box will be sealed and buried somewhere in the new complex, according to the AIT.